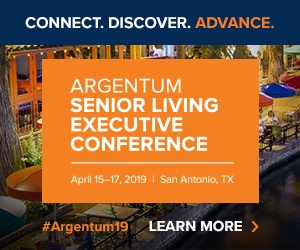 Forward thinking senior living operators recognize the potential for tech to improve customer satisfaction, move-ins, employee retention and have a positive impact on value propositions. Two companies, Sunrise Senior Living and Cogir Real Estate, shared their experiences bringing tech into their operations platforms, with positive results, and outlined upcoming plans during a panel discussion on the future of senior housing on Tuesday. Both companies are operating partners of Toledo, Ohio-based Welltower (NYSE: WELL), and their chief executives spoke at the real estate investment trust’s investor day, held in New York City. A few years ago, Sunrise was a blank slate when it came to technology, CEO Chris Winkle said. “We come from a technology desert,” Winkle said. But the McLean, Virginia-based senior housing operator has made progress in a short time. The linchpin in Sunrise’s tech adaptation is CareConnect, its centralized electronic health records system, which allows residents to personalize care by scheduling medication reminders, activities and other real-time updates about their needs, allowing family and health care providers to adjust their care as required. Sunrise also conducted a focused analysis of its assisted living communities, using electronic health record data and time studies of the workloads in 22 different roles, measuring daily workload for where time was spent. Sunrise employees can now track and update their daily workflows online. Sunrise was an early adopter of Arena, the predictive data analytics platform which allows senior housing operators to make better hiring decisions and reduce attrition. A pilot of Arena reduced Sunrise’s attrition rate by 10%. The platform is now standard across the company’s portfolio. The combined efforts have been adopted across 97% of Sunrise’s portfolio, improved customer satisfaction, move-ins, and team engagement, Winkle said. CareConnect even has a tie to Sunrise Advantage, Sunrise’s Medicare Advantage platform. Although the company is 99.5% private pay, it recognizes the opportunity Medicare Advantage offers to operators to coordinate resident care with provider networks and distribute Medicare funds, Winkle said. This echoes comments that he recently made to Senior Housing News in an interview for The Leadership Series. Since Sunrise Advantage launched, physician referrals to Sunrise are up 300%, Winkle said on Tuesday. Cogir, based in Brossard, Quebec, bought a 20% investment — $4 million Canadian — in a voice-activated artificial intelligence platform it intends to roll out throughout its portfolio in Q1 2020, President and CEO Mathieu Duguay said at the Welltower event. This “virtual concierge” should help improve customer experiences and employee productivity related to telemedicine, apply a preventative and reactive approach to fall prevention, and remind residents about medication times, meals, activities and birthdays. Duguay believes this system will allow Cogir to create $50,000 in added value per unit when it launches across its portfolio in Q1 2020. Cogir operates 3,000 Canadian senior living units in conjunction with Welltower. In August, the company entered the U.S. market, paying Welltower a $68.2 million equity investment and taking over the operations of 12 former Brookdale Senior Living properties . Duguay wants to operate up to 100 communities in the U.S. within the next five years.